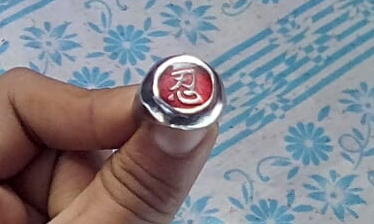 This is a ring with a red seal and gold "忍" emblem. I don't know whether this type of ring is in Naruto. Who wears it? Is it a knockoff? This is a ring made in the style of the Akatsuki rings. However such designs are merely inspired and have little to no bearing to the Naruto franchise itself. I will not post links to any online vendors, but you will find many like it from various vendors if you do a cursory Google search for something like "shinobi symbol ring." If you add Naruto to the query you might get more franchise relevant. Not the answer you're looking for? Browse other questions tagged naruto merchandise cosplay or ask your own question. How do the 3 sannin know about using Five Elements Seal on Naruto? How do Naruto and Sasuke manage to beat Kaguya so quickly?